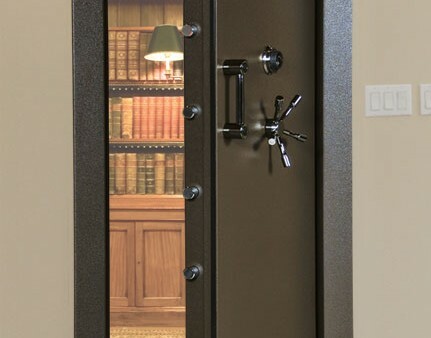 The vault door combines style with superior theft and fire protection for an elegant look that fits any décor. Spy-proof key-locking dial with matching five-spoke handle, pull handle and bold zinc die-cast logo. Available in polished brass, chrome or black nickel finish. Select from four textured finishes. Commercial grade, Vault Door hinges. New – Adjustable door frame slides together to fit a wall thickness of 4-3/4″ to 9-3/4″. Safety Lock Release: allows you to safely exit the vault room from inside. It also allows you to close and lock the door from the inside when equipped with an electronic lock, turning your vault into a safe room. 2” thick door offers a defense barrier constructed of a 1/8” inner and ¼” outer steel plates filled with a fire insulation material that provides a barrier against extreme heat. 2” thick door offers a defense barrier constructed of a ½” steel plate door combined with 1-3/8” DryLight insulation that provides a barrier against extreme heat. VD8030SF 79½” H x 29½” W 77½” H x 26½” W 77½” H x 20-5/16″ W 523 lbs. VD8030BF® 79½” H x 29½” W 77½” H x 26¼” W 77½” H x 19-7/8″ W 695 lbs. VD8036SF 79½” H x 29½” W 77½” H x 32½” W 77½” H x 20-5/16″ W 612 lbs. VD8036BF® 79½” H x 29½” W 77½” H x 32¼” W 77½” H x 19-7/8″ W 819 lbs.